It has happened slowly. Many of us have not even noticed. Little by little, the cities we inhabit — malls, shopping centers, movie theaters, private plazas, parks, and in some unfortunate places even entire streets and neighborhoods — become increasingly privatized. Yet many of us do not often stop and ask ourselves what this means and what we are losing in the process. What happens to democracy when we do not have the spaces to meet, organize, and collectively plan for our future? What happens when our city does not belong to us? On September 17th, 2011 the Occupy Wall Street movement brought new light to the privatization of the city when a group of activists occupied Zuccotti Park, a Privately Owned Public Space (POPS) in New York City’s Financial District. POPS legislation was developed in 1961 as a way to let developers negotiate building variances, often increasing the square footage of rentable space, in return for plazas and parks that should be open and welcoming to the public for multiple uses. The legislation has led to private entities building 3.5 million square feet of areas that they control but are, in theory, public. Further, the rules governing the different POPS can be confusing and, at times, contradictory to actual law. After all, what does it mean when the POPS at 60 Wall Street asks people to not use space ‘excessively’? With this and other questions in mind, design collaborative DSGN AGNC organized a group of concerned designers, artists, lawyers, educators and citizens to launch #whOWNSpace. Thus far, groups that have contributed to #whOWNSpace include DSGN AGNC, who provided the initial vision, along with DoTank: Brooklyn, 596 acres, The Public School New York, BRUNO, and Not An Alternative. 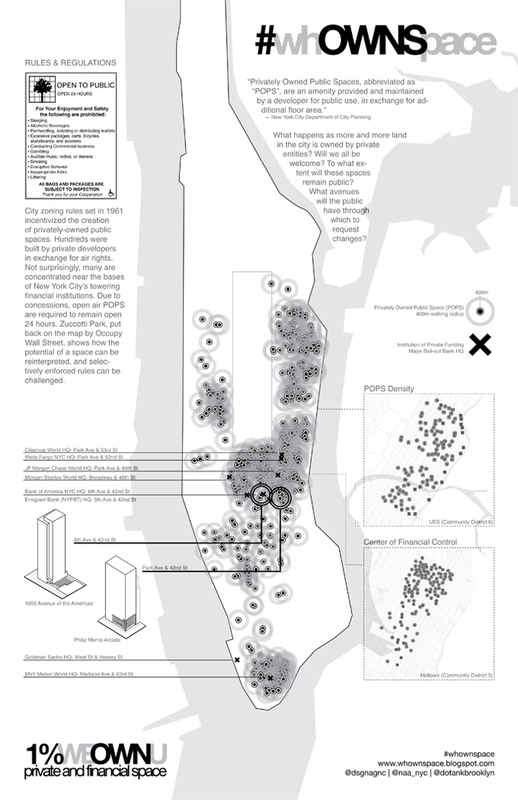 At its core, #whOWNSpace arises from questions that the Occupy Wall Street movement brings up about ownership and use of open space in New York City, and cities around the world. The project seeks to reveal and question the often-conflicting rules that govern privatized public space, to advocate for changes when necessary, and to propose alternative policies, uses and designs for public space that encourages democratic vitality. The group has already taken on a variety of projects. 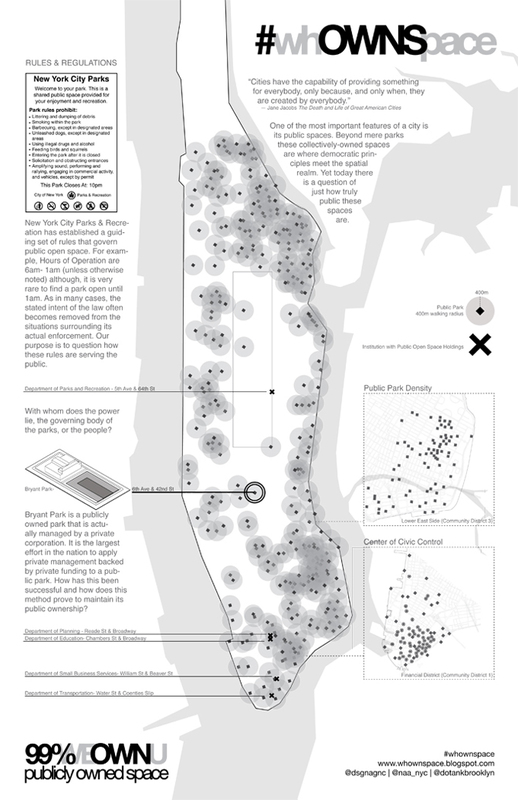 We have created maps showing all available information about POPS and other public spaces that we distributed broadly, letting people know where there are spaces that are intended to be for public use; this information is crucial since many POPS are managed by building owners in a way that does not communicate their public nature. 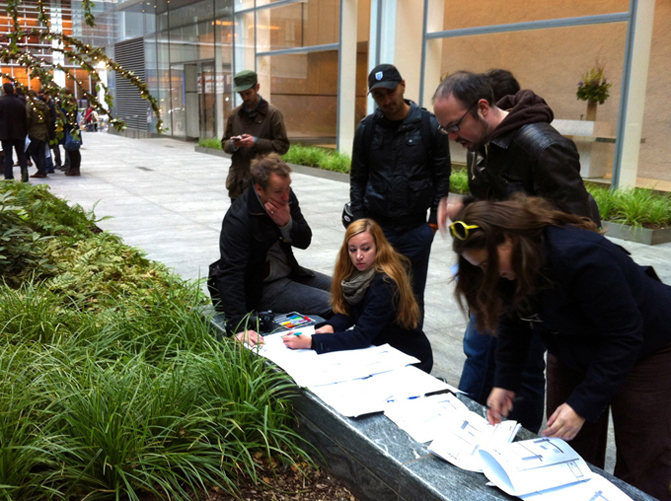 Other projects have included walking tours in which we seek to democratize design education and, together with community members, gain better understanding of the public realm in different communities. 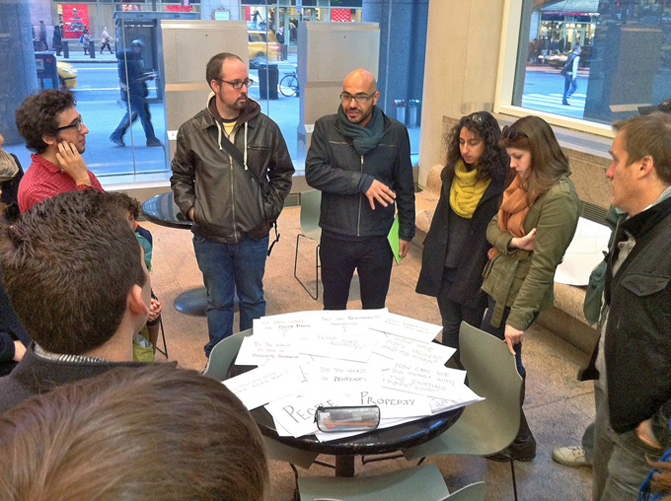 Along with these design and educational projects, the #whOWNSpace legal team engaged the public in asking for city agency involvement in getting Zuccotti Park’s owners to comply with zoning regulations and remove the barriers that surrounded the park for nearly two months. Through a public education campaign about how POPS actually fit within municipal regulatory structure, over 100 complaints were filed with the Department of Buildings (DOB), the city agency charged with enforcing zoning. The New York Civil Liberties Union, The New York City Chapter of the National Lawyers Guild and the Center for Constitutional Rights added their voices to the citizen complaints in a letter to DOB and press release, working in collaboration with the #whOWNSpace team and building on our research. The barricades came down a day after that letter was sent. We are now focusing on the public plaza in front of the One Chase Manhattan Plaza building that has been closed since September 16th, 2011. This Skidmore, Owings and Merrill (SOM) plaza is one of the inspirations for POPS legislation; SOM’s form of innovation was to chose to use 2 1/2 acres of valuable downtown real estate for a plaza meant to be open to the public. The plaza has become such an integral part of the fabric of lower Manhattan that it was designated a NYC Landmark in 2009. 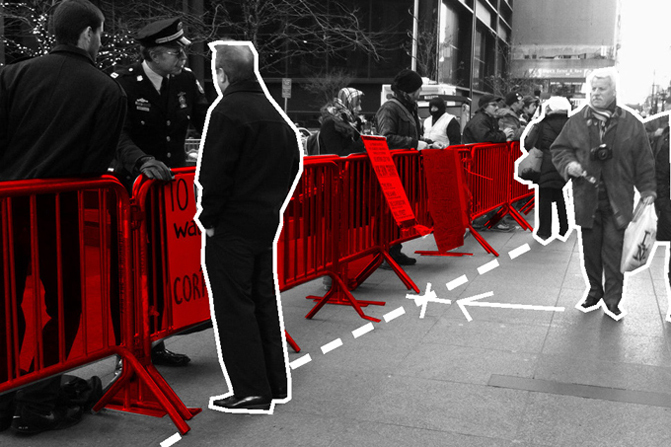 Through these projects we have begun to better understand both the state of public space in New York City and the confusing set of rules that governs it. However, many of the rules we have encountered often make one thing explicit: POPS are meant to be used by the public for ‘passive’ uses, like eating lunch. Active uses, including canvassing, holding meetings, organizing communities, are not contemplated. Yet, these activities are needed in a democratic society as they help people become informed and to participate in their political system. These observations on what privatized public space is doing to democratic involvement have lead #whOWNSpace to propose and begin to work on what we are terming a BLACKBELT in the neighborhood of Greenpoint, Brooklyn. A BLACKBELT rejects the notion that public space can only be used for passive activities. Instead a BLACKBELT seeks to create a network of public spaces to be used by local groups for community engagement, organization, and action. This ongoing project has garnered the support of local community groups, politicians, and a committed contingent of designers, artists, lawyers, and journalists. The group is diverse and the tactics we use to reach our goal will be varied, taking into account the skills that all the participants bring to the project. In 1988, public space advocate William H. Whyte wrote that POPS and their (often undemocratic) rules would need “a stiff, clarifying test…”  #whOWNSpace postulates that this is the moment for such a test to happen. From New York to Miami to Shanghai to Baghdad, it is time to question public space and the privatization of the city. Are cities today serving all the needs of the public and fostering democratic vitality? The Arab Spring and, specifically, events in Tahrir Square, Egypt, have shown that digital platforms cannot supplant the city and its open spaces as catalysts for political change. 1. Whyte, William H., and Albert LaFarge. The Essential William H. Whyte. New York: Fordham UP, 2000. Page 317. Quilian Riano is a designer, writer, and educator currently working out of Brooklyn. Co-founder of DSGN AGNC, his current interests and research are focused on the design and implementation of flexible and hybrid designs at a variety of scales to address urban, landscape, architectural, ecological, and social systems.